5.0 out of 5 starsAll Good! Poetry is something I seldom read, but the range of philosophical and religious reflection in Hafiz' writing is amazing, delightful, and life-affirming. Not every poem is equally rewarding, but how could they be? The translations make these ancient short poems speak to the present day, but sometimes too much so--using terms that have only come into our language in the 20th or 21st centuries at times borders on "cutsie", which distracts from the true meaning. When Ladinsky sticks to standard and time-tested language and grammar, his translations have much deeper impact, for me anyway. I have not read other translations of Hafiz, but I imagine previous ones are full of "thee's" and "thou's", and less erudite perspectives. I highly recommend this book--for me is has more understanding and depth concerning daily living than Rumi, for instance. Just beware that there are some shockingly off-the-mark, if sincere, attempts to make this ancient poetry relevant to us now. Ladinsky apparently spent years working on this book, so my hat is off to his scholarship. 5.0 out of 5 starsA translation reflecting the Sufi's focus on the divine. Many Sufi books, especially Sufi poetry, are difficult to use with youth since they have the tendency to take allegorical material as fact (when reading about love of God, that the poet is saying that he gets drunk or is having an affair with a particular woman, etc). Many translators, especially western translators, also have this trouble. However in this translation, the poems are beautiful translations that more faithfully translate the poet's intention. 5.0 out of 5 starsA poet's poet, a mystic's mystic, every page a joy! Amazing poetry. Almost every piece has an "ahah!" in it, a surprise or a shock of recognition. 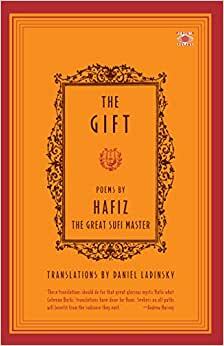 I love Hafiz - although he lived many centuries ago, his poetry is so pertinent, and so beautiful, and this translation makes it very contemporary.